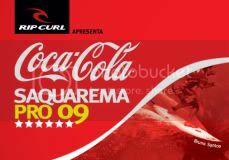 The Coca-Cola Saquarema Pro '09 runs from July 14 - 19. Woody surfs in the round of 144 and Mello starts in the round of 96. Good Luck Fellahs. Woody had a huge win in tiny windswell garbage to go into the round of 96. It was definitely the opposite of the Dream Tour out there today. Good stuff overnight from Brazil with Woody and Mello both making it thru to the round of 48. They will be surfing in the 2nd & 3rd heats of the day when competition resumes @7:30 am local time. Woody had the bad luck to draw a heat with 3 Brazilians. He stayed strong and tried to hold the inside for the whole heat. Unfortunately the Brazil-nuts did a number on him and Jimmy had to cop it. Mello surfed against a crew from everywhere except Brazil but he lacked his usual intensity and was left behind for another 37th. These heats are a lot longer than 15 minute Le-Ba heats but you cannot win a heat without 2 good waves. Up next is the Hurley US Open of Surfing. with a record $US 100,000 1st prize.